Grand Canyon University continued its strong community outreach efforts over the weekend by supporting the Canyon Cares/Arvizu Ninos Seguros Back to School Health & Safety Fair. More than 5,500 Canyon Corridor community youth and their families were on campus Saturday for the 11th annual event in Antelope Gym. 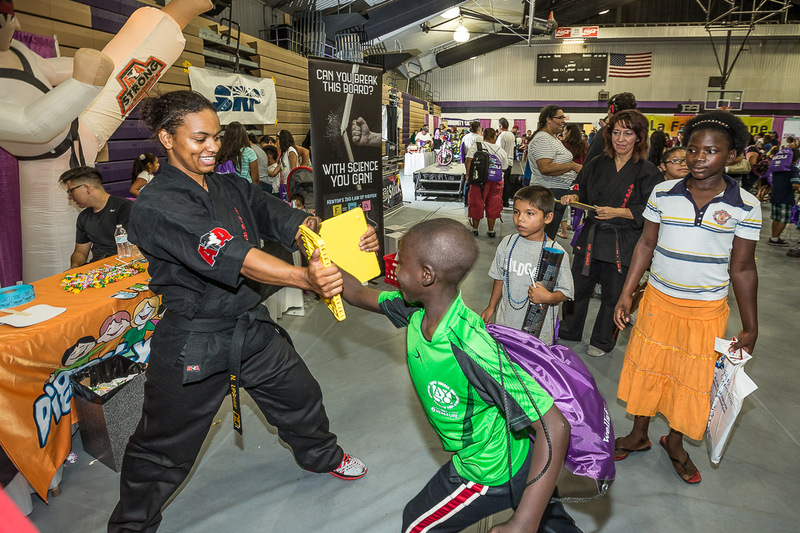 The event prepared children to return to school by providing free backpacks, school supplies and health screenings. Those who completed the health screenings were eligible to win prizes, which included 10 bikes, five laptops and five iPads from local vendors. The event also included karate demonstrations and safety presentations, and families were able to interact with Phoenix City Councilman Daniel Valenzuela. Faith Weese, GCU’s chief University relations officer who has been involved with nearly every Ninos Seguros event, said Saturday’s was the biggest in its history. GCU had more than 100 volunteers on campus, among them 40 students from the College of Nursing and Health Care Professions who provided thousands of free screenings, including eye exams and basic checkups. Connie Colbert, director of the Canyon Health and Wellness Center, volunteered at the event for the first time and supervised the nurse volunteers. 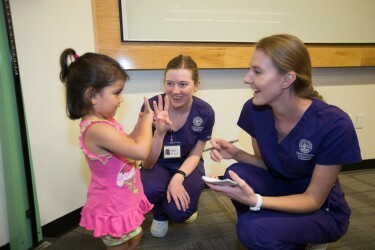 It was an educational opportunity for nursing students to apply lessons from GCU courses and for community members to become more aware of their health needs and receive training on basic self-care, she said. “This event is great for our students and the community. Our students were able to receive practical application of what they are being taught in class, and people in the community had the opportunity to have their vision tested or blood pressure checked and learn how to stay healthy,” she said. Health screenings began at 9 a.m., but waiting lines to the three screening rooms were out the door as early as 8 a.m., said senior nursing volunteer April McKay who helped with eye exams. McKay, who plans to graduate in December, volunteered in order to obtain community clinical hours needed to graduate. The event provided valuable experience working with community members that she hadn’t received in two previous clinical rotations, McKay said. She said she enjoyed the event and hopes to volunteer again after graduation.